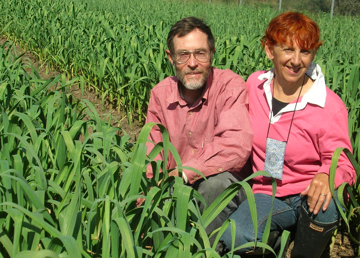 Our names are Fred Koch and Neroli Hadfield and we grow organic garlic at W Tree which is 25 kms north of Buchan in East Gippsland, Victoria. Ontos Farm was established in 1977 as the 5th organic farm certified by the National Association of Sustainable Agriculture Australia (NASAA). For many years Fred operated a yoga centre and health retreat on the farm. In 2002 the retreat facilities were sold to a Tibetan Buddhist organisation and organic certification was voluntarily terminated as we no longer planned to sell produce off the farm. But we are back into healthy food production. 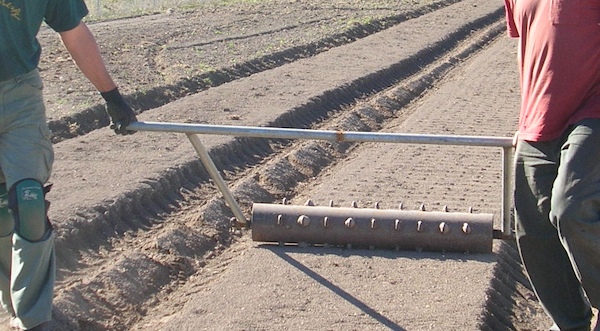 We kangaroo proof fenced and installed spray irrigation on five hectares of fertile creek flats and planted a trial plot of garlic (500 sq metres) in April 2010. We planted several varieties to see which we liked best and which suited our conditions. We initially produced about one tonne of garlic. In May 2011 we finished planting 1500 sq metres of the variety we liked best. It is a beautiful large cloved hardneck variety with pretty purple stripes, a flavoursome taste and a heat of around 8 out of 10. Since that time we have expanded our planting area to 2000 sq metres and continue to plant this variety. We are very happy with it and have called it "Ontos Purple" as we have found that it has taken on characteristics of the area in which it has been grown. We have re-established our organic status with NASAA. We see organic certification as of benefit to both the consumer and ourselves. The consumer is given a guarantee of our clean practices and we are kept informed of all the latest developments in the organic production world. We learnt a lot about garlic in the past couple of years. One aspect that stands out is the vast amount of hand labour to present an attractive product. The garlic gets personally handled several times in the flow of hand harvesting - removing the roots, pre-drying on racks, removing the bulbils and stems, placing on racks in the storage room and finally cleaning off the last bits of dirt before delivering it or boxing it for the post. We get to know each bulb very well during these processes. We try to make use of either our own or local innovations such as using mulch collected from our paddocks and the creation of planting and harvesting tools. We are fortunate to have a wonderful team of wwoofers/helpers from various parts of the world to help us during busy times. LATEST INFO: We have sold out of garlic for this season. A big thank you to all our customers for your support. We hope you have enjoyed our garlic.